Four Chinese missile manufacturers and exporters were slapped with U.S. sanctions for illicit sales related to North Korea, Iran, and Syria, the State Department said in a statement late Monday. The sanctions were imposed under the Iran, North Korea, Syria Nonproliferaiton Act on four Chinese firms as well as two Belarusian companies. The Chinese firms include the China Precision Machinery Import Export Corp., a company identified recently by the Washington Free Beacon as working with Egypt’s government and North Korea to modernize Cairo’s short-range Scud missiles. The other Chinese firms were identified as BST Technology and Trade Company, Dalian Sunny Industries, and Poly Technologies Incorporated. A Chinese national sanctioned in the past for his role in illicit arms and missile transfers to the Middle East was also sanctioned. He was identified as Li Fangwei, also known as Karl Lee. Rick Fisher, a China analyst at the International Assessment and Strategy Center, said Dalian Sunny and Karl Lee are well known arms proliferators with activities that span two U.S. administrations. ‪"It does not appear that China is listening to U.S. complaints or sanctions, in much the same way as it refuses to talk about its growing nuclear missile arsenal, and its growing threats to Taiwan and Japan," Fisher said. ‪"It simply begs credulity that two U.S. administrations have sailed along blithely in hopes that ‘dialogue’ and wrist-slap sanctions would have any impact on a Chinese regime that has clearly decided to sell, give, or facilitate the transfer of missile technology to Iran and North Korea so they can target the United States and its allies with nuclear missiles," Fisher said. ‪"In Realville, this would be called an act of war, but in Washington, it appears to be cause to reward China's leaders with invitations to global nuclear control summits." Two Iranian companies, the Iran Electronics Industries (IEI) and Marine Industries Organization (MIO) and one Iranian national identified as Milad Jafari were sanctioned. Additionally, two Sudanese companies (Al-Zargaa Engineering Complex (ZEC) and SMT Engineering), one Syrian agency (Army Supply Bureau (ASB)), and one Venezuelan firm (the Venezuelan Military Industry Company (CAVIM)), also were named. As with past practice, the State Department provided no details of the sanctions activities. The sanctions were based on "credible information indicating they had transferred to, or acquired from, Iran, North Korea, or Syria, equipment and technology listed on multilateral export control lists (Australia Group, Chemical Weapons Convention, Missile Technology Control Regime, Nuclear Suppliers Group, Wassenaar Arrangement), or items that are not listed, but nevertheless, could materially contribute to a weapons of mass destruction (WMD) or cruise or ballistic missile program." Li Fangwei and his company were also sanctioned for "transferring equipment and technology controlled under the Missile Technology Control Regime (MTCR) Annex to MTCR-class (Category I) missiles in a non-MTCR country." The 34-member MTCR is a voluntary group of nations that seeks to limit sales of missile and related components. Category I includes complete missile systems. The basis for the sanctions could not be learned Monday night. However, China transferred strategic missile technology to North Korea last year. That tech consisted of several road-mobile transporter erector launchers first identified in a Chinese military parade in April. 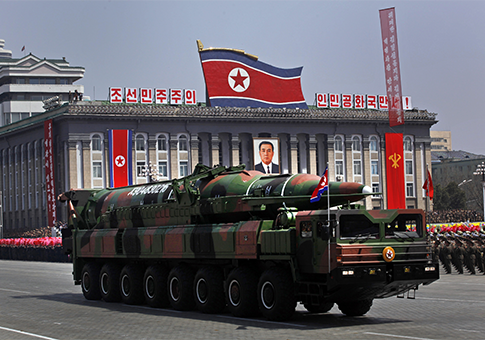 The launchers are being used for North Korea’s new road-mobile long-range missile called the KN-08. Additional sanctions were imposed under a 1994 presidential executive order aimed at curbing missile and weapons of mass destruction transfers on Li, Dalian Sunny Industry, and the Iranian entities Shahid Bakeri Industrial Group (SBIG), Shahid Sattari Ground Equipment Industries, and the Ministry of Defense and Armed Forces Logistics (MODAFL). The sanctioned entities were involved in missiles and weapons of mass destruction transfers that were not specified. The two-year sanctions are largely symbolic and prevent U.S. government agencies from doing business with the entities. Additionally, they prohibit the granting of U.S. export licenses for U.S. companies to sell items to the entities. A CIA-origin report to Congress made public last year said that Chinese companies, both state-run and private, "continue to engage in [weapons of mass destruction]-related proliferation activities." Chinese government steps to halt the transfers continue "to fall short," the report said. Defense officials have said China is a major supplier of missiles to Iran and North Korea and the arms proliferation activities received little public notice. The U.S. government has used sanctions against Chinese companies in 2005, 2007, 2009, and 2011 for illicit transfers of weapons and technology. China’s state-run Xinhua news agency on Monday reported that one of the sanctioned companies, the defense company Polytechnologies Inc., denied it was involved in illicit arms transfers. "We have never helped any countries or regions develop any banned weapons, nor have we exported or promised to export weapons or technologies to any countries or regions that are under United Nations Security Council Resolutions Sanctions," the company said, according to Xinhua. "We hereby demand the U.S. side to respect the fact and immediately lift the sanctions," the firm said. According to a State Department cable made public by Wikileaks, Pakistan in 2008 provided Polytechnologies with U.S.-origin precision-guided bomb technology used on MK-82 bombs. A 2008 cable stated that Chinese national Karl Lee "is a serial proliferator who has provided large quantities of materials and missile-relevant equipment to SBIG." Lee in 2008 supplied gyroscopes and accelerometers to Iran that are used in missile production. A March 18, 2009 cable stated that in late December 2008, a Chinese company called LIMMT "continued to supply SBIG with tungsten copper, graphite, and aluminum, and that Karl Lee offered SBIG a model 3GFF-700 cold flow forming machine. Such a machine is capable of manufacturing re-entry vehicle shells and solid rocket motor cases, and is controlled by the MTCR, the Nuclear Suppliers Group, and the Wassenaar Arrangement." This entry was posted in National Security and tagged China, Iran, Middle East, Missile Defense, North Korea, Obama Administration, Syria. Bookmark the permalink.